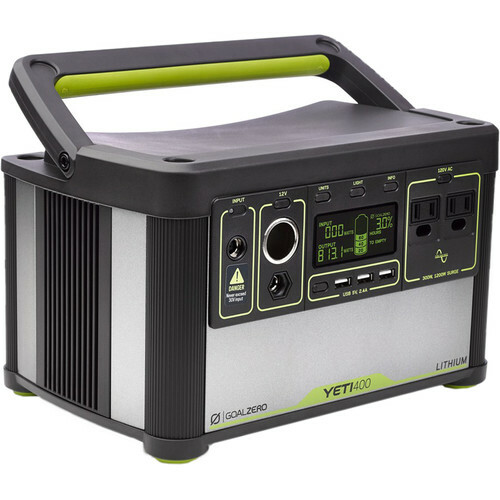 Whether you're off the grid or the grid is down, you can power laptops, tablets, lights, TVs, tools, medical devices, and more with the Yeti 400 Lithium Portable Power Station from Goal Zero. An alternative to the noise, fumes and hassle of traditional backup generators, the Yeti uses a 428Wh lithium battery that can be charged from 110 VAC house current or solar panels. The front display panel provides readouts of incoming and outgoing power, and battery status in 20% increments. This real-time feedback enables precise power management. The Yeti provides an array of output options for any energy need. It has two standard 110 VAC grounded wall plugs, four standard USB ports, a 12 VDC vehicle cigarette lighter-style socket and a 6mm 12 VDC port. The battery is easily replaced at the end of its 500-charge life cycle. The pure sine AC outlets have a maximum surge capability of 1200 watts. The Yeti recharges on AC power in 7 hours and in 16 hours from one Goal Zero Boulder 50 solar panel. Box Dimensions (LxWxH) 14.016 x 12.047 x 9.921"
Yeti 400 Lithium Portable Power Station is rated 5.0 out of 5 by 1. Rated 5 out of 5 by Sanford from Don't even consider anything else While I have this Yeti 400 Lithium and the Yeti 1400 Lithium, I use this one (Yeti 400 Lithium) daily. I hook it up to a Goal Zero Boulder 100 and 200 Briefcase Solar Panels and plug in all my devices that need re-charging like: Greenworks batteries for my Lawn Mower, Blower, Trimmer, Weed Wacker, my rechargeable Stinger Bug Zapper, my SunJoe High Pressure Washer, my battery banks for my phone, iPad, Drone Batteries, even my electric toothbrush and razor. I especially like the information panel which show input/output power/% of battery remaining and time until depleted This unit, like all Goal Zero products, is reliable, well made and well designed. It simplifies my life and I get a lot of satisfaction by charging everything on Solar. Yes, Goal Zero is proud of their products, but, IMO, superior to their competition. I do also own the Suaoki G500 which has similar power to the Goal Zero Yeti 400, but it can not charge items while itself is being charged, does not let you keep the backlight on the not-enough-information LCD display. I highly recommend thus Goal Zero Yeti 400 Lithium. How many amps do the 12volt outlets provide? Also, what are the battery amp hours? The 12V jacks provide 10A. The battery supplies 39.6 amp hours. Can the Yeti 400 Lithium be hooked up to 2x 100w solar panels to make it charge faster? Or is there a limit to how many panels you can connect? Thank you. You can chain the 50W panels, up to 150W. The 100, (which is really just two 50s) can also be chained but only up to 150 W. To chain two 100s, you would need to add the a combiner cable from GoalZero. The recommend you give them a call.